This month's Daring Baker Challenge was hosted by yours truly. In true DB form, I chose something I had never made before and was not at all certain would turn out nicely. As the host, I should have picked something awfully easy (Ha!) but instead I chose to have our baking conglomerate make a Lemon Meringue Pie. LMP is not difficult to make. There is a crust, filling and meringue. There was a lot of chatter on the DB blog beforehand about the curd filling with some bakers vouching for its fabulousness and some for its lacklustreness. It is with all these thoughts swirling in my head that I made my pie. So I want to thank all the Daring Bakers who chose to participate this month. There were lots of different results - some great and some not so great. If you follow the exploits of the Daring Bakers, please check out our blogroll to see Lemon Meringue Pies from around the world. If you're looking for something super chocolatey, these cookies are for you. They take a little bit of work and a ruler, but the end result is definitely quite worth it. So if you're going to make them, just take your time and read the instructions. Even though I measured perfect 10 x 10 squares, some cookies came out wider than others. And when you're done, you get to lick the extra ganache off the spoon. Yum! I think there is no limit on what you can do with a basic oatmeal cookie. Eat them plain or dress them up - either way, they're one of my favourite cookies. These oatmeal apple cookies are no exception. I ended up making them because I wanted to use up some apples that were better suited for baking rather than eating. After throwing in the optional walnuts and raisins, I had a pretty hardy, quasi-healthy cookie. The addition of fresh apple added a nice texture complement to the crunchy nuts and chewy raisins. Each bite was different which made these cookies anything but boring. They went over well in my house but I believe these cookies are best eaten soon after they are made, not a week later. On another note, I would like to thank all of you that read my little blog. This month is Canadian Baker's 2nd Anniversary and what a two years it has been. In 2006 I had no idea how vast and amazing the food blogging world was and now in 2008 I am proud to be part of this virtual community. It has been a great ride and I've met some wonderful people all because I wanted to share my baking with others. Once again, thanks for your support. You guys are the best. 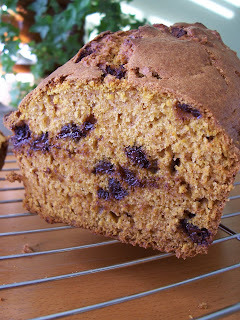 If you're looking for something easy to make with pumpkin puree, definitely think about making Pumpkin Chocolate Bread. It's quick, virtually mess-free and tasty! I don't make quick breads as much as I used to. I like making them since you pour everything into a pan and forget about it for about an hour. The only thing that bothers me is that, because of the loaf's density, my crust always comes out looking a little more done than it should. It gives the overall deceiving appearance of being overdone while, in fact, its not. This loaf was no exception. The exterior is dark and browned while the inside is moist, flavourful and studded with chocolate chips. They serve this loaf at Island Lake Lodge in B.C. to the delight of skiers. It's perfect on a cold winter's day with a hot drink to warm up after an afternoon of snowman building, sledding and snowballs. I apologize for being MIA for so long. The holidays were busy and fun but left little time for posting. Finally, I have some down time and can concentrate on blogging! I made this cake about three weeks ago for no particular reason other than I wanted to make a plain 'homey' cake but don't let the simplicity of the name deceive you. 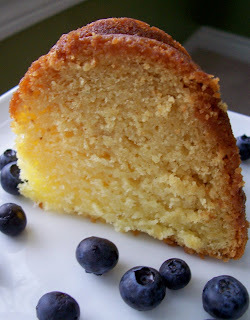 When made, this cake is moist and full of orange flavour. The egg whites are added in separately so you get a nice light cake that tastes even better if you serve it with the syrup and blueberries. It's the kind of cake that looks inviting on a cake platter waiting to be shared with friends. You can also make this cake in six mini 1-cup Bundt pans. Just halve the batter and bake for only 30 minutes. Either way, you'll have some great cake to enjoy!